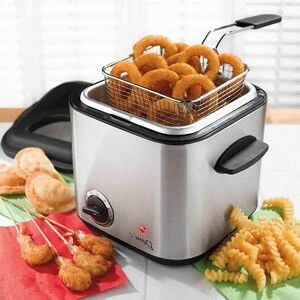 If you want to purchase the best cheap deep fryer, first you will have to decide how much universal device you need. 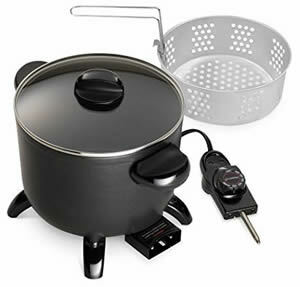 Do you just want to fry or also cook steamed vegetables, make soups and roast meat? Nowadays, several devices are often combined into one. Fortunately, this versatility does not affect the cost – you can get everything for the same price. In this comparative review, we will consider deep fryers in the price range of 25-45 dollars. All of them have their pros and cons, and you have to make a choice based on your needs and sympathies. Our list contains only deep fryers with the best ratings in 2019. Thus, you can be sure that you will get a product that has been tested by many people and has no hidden flaws. 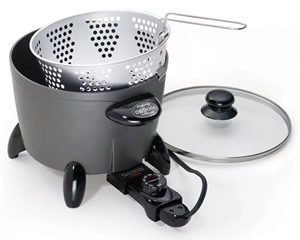 It’s not just a deep fryer, it’s a versatile appliance for cooking soups, making pasta, steaming vegetables and many other things. Full control over the temperature will allow you to cook the rice so that it does not burn. And steamed vegetables are always above all praise. You can also fry the meat, but use a non-metallic spatula to avoid damaging the Teflon surface. 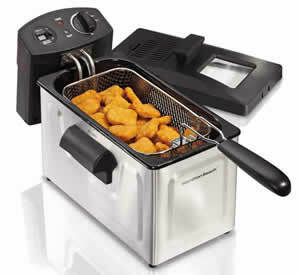 And, of course, this is definitely a great fryer. Due to sufficient depth, the oil does not splash. Besides, the glass cover that comes with the kit provides additional protection. 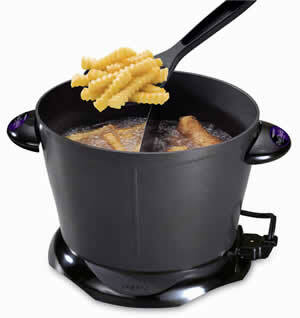 You can fry meat, chicken wings, fish, French fries – any product that fits in the fryer. The instruction with the indication of the cooking time for each type of products is attached. Presto 06003 is completely dishwasher-safe, in addition, it is very easy to clean it manually. Please note: Do not use steel or abrasive cleaners, as they can damage the non-stick coating. This deep fryer is extremely easy to use, and, of course, its price is very pleasing. This model is slightly cheaper than the previous one, and it is slightly less powerful. The main difference: Presto 06006 has a lower capacity than 06003. Is it good or bad – that depends on your needs. Of course, a compact deep fryer is easy to store and can be placed in the refrigerator to save oil for reuse. In addition, you can take it with you on a journey. 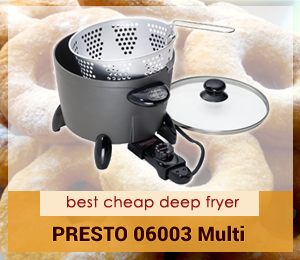 With the help of Presto 06006 you can boil eggs or cook soup, make pasta or steam vegetables, roast meat or use it for its intended purpose – for deep-frying. All this will help you to save a lot of money on traveling, besides, you can eat healthy food. The huge advantage of this and the previous models is that non-stick finish does not exfoliate. For this reason (and also because of its versatility), we advise you to choose Presto 06006 or Presto 06003. Of course, you should only use plastic or wooden spatula during cooking, and do not use abrasive materials when cleaning the deep fryer. If you use a dishwasher to clean the basket, do not add a lot of bleach – this can lead to rust. This device is extremely easy to operate: just turn on and deep-fry. The temperature required for frying is maintained automatically. Instead of the usual basket, the manufacturer offers a handy scoop, which is much easier to clean. By the way, the fryer itself needs to be washed manually, it is not dishwasher-safe, since outside there is a place to plug in the cord. This deep fryer comes with the lid, but do not try to use it as a splash protection during cooking. The lid is made of plastic and is not designed for high temperatures. The purpose of the lid is to help you keep the oil. The manufacturer promises us saving money by using oil several times. This is possible if you are frying the same product – donuts or fish. You can use oil 3-4 times. If you cook food in breading, then you will have to change the oil more frequently, since the breading settles on the bottom. If you use the deep fryer less than several times a week, you can cover the fryer with a lid and put it in the fridge – so the oil will last much longer. The ideal oil/product ratio is 4:4. What can you cook at a time: 2 cups of french fries, 4 to 6 chicken or 3 chicken legs. 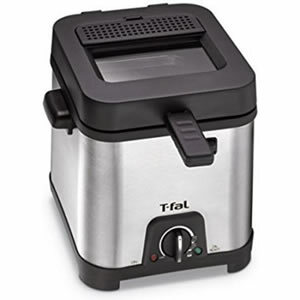 If this is not enough for you, buy Presto 05411 GranPappy Electric Deep Fryer – this is exactly the same model, but it has a larger capacity (6 cups of oil) and power of 1500 watts. GranPappy is perfect for a family of four. A few words about the coating. It’s not enamel, not Teflon, but non-stick coating made by Whitford. Keep in mind: over time, the coating can begin to flake off. This usually happens if you use a metal spoon for stirring, use abrasive materials for cleaning, or refrigerate a device that has not cooled down. This model is similar to the previous one, but has twice the capacity and more power. The original feature is the divider, which is inserted inside the pot. Thus, you can simultaneously fry two types of products. In addition, you can remove the divider, and you will have enough room to fry large pieces of meat or fish. Nevertheless, the whole chicken does not fit into the pot, keep this in mind. The lack of temperature control can disappoint experienced users, but it is very convenient for beginners – it is enough to just turn on the device. If you have not decided yet whether you want to cook deep fried foods often, buy this inexpensive fryer to get the right impression. Remember that the bowl cannot be immersed in water and washed in a dishwasher after use, allow the appliance to cool to room temperature, then wipe off the fat with paper towels and use a nylon rag and soapy water for final cleaning. The non-stick coating cannot be scraped by metal objects and exposed to strong acids. 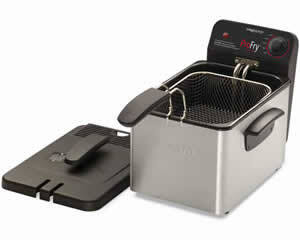 Despite the low price, this fryer is of good quality and will last for a long time. The non-stick coating of the frying pan is very reliable, does not exfoliate and does not cause any problems. Thanks to a convenient size and nice design, Hamilton Beach 35033 will look great on a kitchen countertop. If you plan to store this fryer in the cabinet, it will fit better than the round fryers of similar capacity. Hamilton Beach 35033 has adjustable heat and convenient timer. At the end of the frying, it beeps, so you do not need to stand over it with a stopwatch in your hands and watch the food being cooked. The side surfaces heat up, but do not become too hot, so you will not burn. During cooking, your kitchen surface will remain clean, as the lid prevents splashing of oil. Easy cleaning is also one of the advantages of this deep fryer. This model can be completely disassembled and most elements are dishwasher safe. This model is slightly more expensive than the previous one and has some differences. First, it can be used to steam vegetables or seafood. There is no timer, but there is a light indicator that will inform you of sufficient heating of the oil to start frying. The light comes on at the beginning of the heating and goes out when the desired temperature is reached. With the adjustable thermostat, you can select a frying temperature yourself, but keep in mind that in this model the thermostat is not accurate and the temperature can fluctuate on 20 degrees. Non-stick coating is made of enamel, and this is an undoubted plus, since this material is more durable and safe. National Presto 05461 Stainless Steel Pro Fry is easy to store: handle is removable and can be stored in the container. Basket and enameled pot are perfectly cleaned in the dishwasher. And the heating element, cover and base are better to wash manually in soapy water. Be careful: the outside edge of the frying reservoir could damage your fingers when you handle it for cleaning. This deep fryer is a truly small (and extremely user-friendly) miracle. 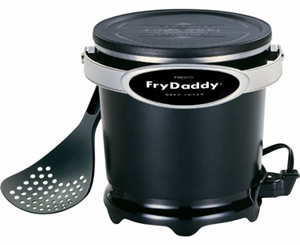 It differs from similar in size fryers with a removable lid and cool-touch side handles for carrying. In many similar models, the lid reclines, but cannot be removed. And here you can easily put it in the dishwasher. And, of course, the lid prevents splashing of oil and the spread of odors. In addition, the cover has a viewing window, so you can always assess the condition of the food. T-fal FF492D has an adjustable thermostat, so you can choose the temperature for frying. But here there is a feature: the temperature specified by the manufacturer refers to the heating element, and not to the oil. If your recipe shows a temperature of 375 degrees, then know that this fryer heats the oil to 350 degrees maximum. Of course, there is no timer, but this mini fryer has two indicator lights. You will know, when oil is ready to start cooking. All items are of high quality. The frying container is made of lightweight durable metal (stainless, not aluminum), which is widely used in the manufacture of cookware. Thus, no problems with flaking coating! The container is very easy to clean, and the food (the remains of the breading) does not burn. All the parts can go in the dishwasher except the heating element and the cord. This model is perfect for families who have small children: due to the specially designed sides, they do not heat up, so it’s impossible to get burned. Another safety feature is the lid, which prevents splashing and keeps the smell of cooking. By the way, when frying, the lid can be both closed and open. And the third is you can lift the basket to drain food without opening the lid. 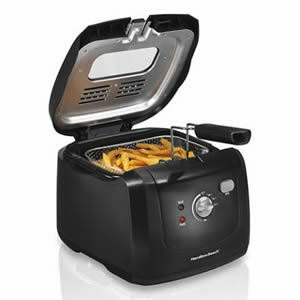 Hamilton Beach Deep Fryer with Cool Touch does not have a timer, but there’s power on and ready lights, so you’ll know when you can start frying. Keep in mind that there is no on/off button, and you have to unplug the unit each time after use. But there is an adjustable thermostat, which allows you to set the desired temperature. The thermostat in this model is quite accurate and well maintains a temperature of 375 degrees. Lid, basket, heating element and oil tank come completely apart from the unit which is great for easy cleaning. The basket is stainless and the interior non-stick bucket is covered with enamel. This fryer is convenient to store in a kitchen cabinet or on a shelf, because the handle does fold down for easy storage.